It's Friday night, it's late, you are stranded in 김해 (Gimhae) and you have a desperate urge to munch on some juicy fried chicken. Where are you going to go? Who will serve you a plate of the crispy, crunchy, feathery goodness that you need so much? 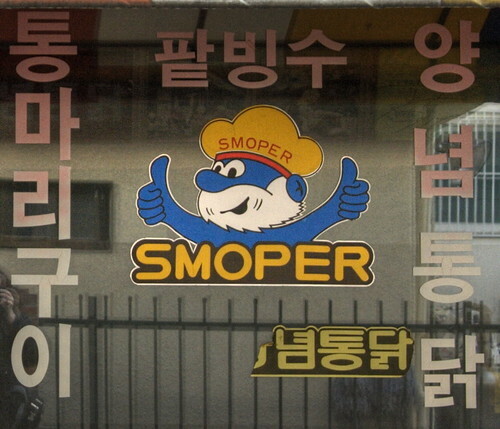 "Smoper" has got your back and he and his friends want to serve you the finest fried, roasted and stewed chickens in the south of Korea. This tiny chicken outlet in the backstreets of Gimhae means no harm and its cutesy portrayal of "Smoper" the fried chicken mascot should be admired. However "Smoper" does seem a little familiar.... His hat may be yellow and his features a little distorted, but he does remind me of a figure from my childhood. Is "Smoper" Papa Smurf's long lost cousin? Is Peyo rolling in his grave? Searching for "스모프" on google I found the parent website for this intriguing chicken franchise. So it seems that this rather blatant copyright infringement is not isolated, but that there are in fact a fair number of "Smopers" selling their wares across the country. Better not let the Smurfs know.... Turns out they call themselves "Smupers" (스머프) in Korean.